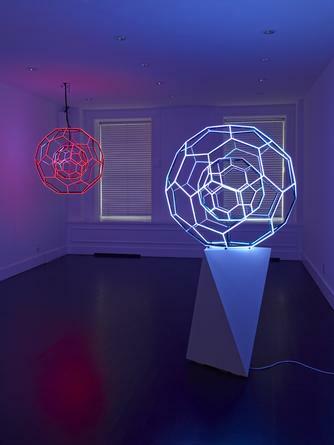 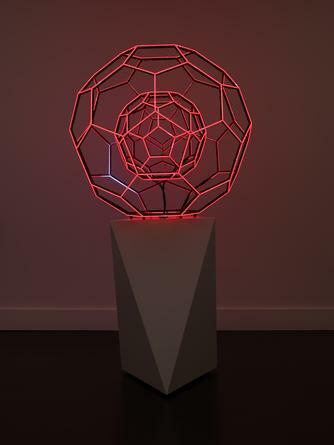 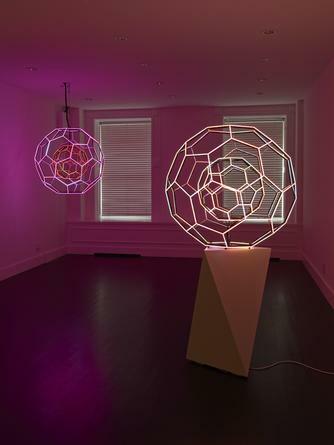 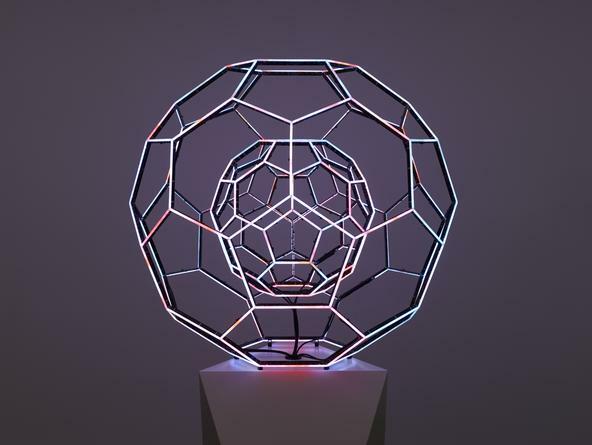 SANDRA GERING INC. is pleased to present Buckyball, Leo Villareal’s most recent light sculpture. 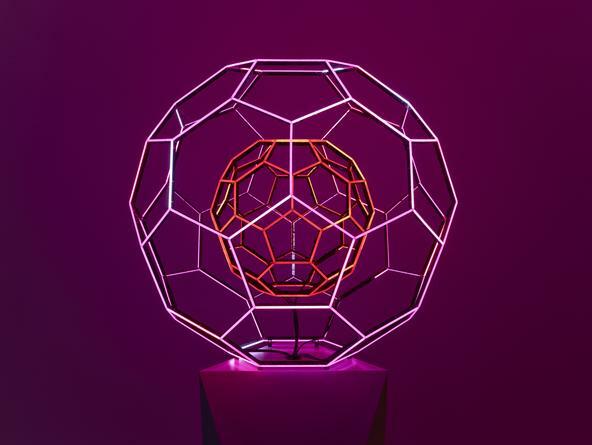 Manifest in the form of two nesting spheres, Buckyball, 2014 is composed of 180 custom-made LED microtubes arranged in a series of pentagons and hexagons. 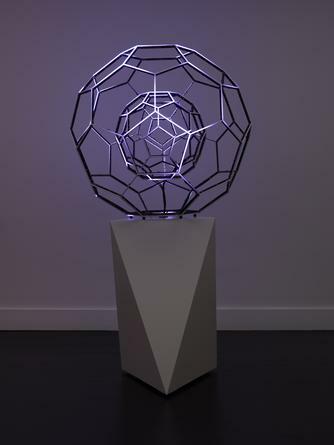 The artwork takes on the form of a 'fullerene', discovered by nanotechnologists at Rice University in the 80's and named after Buckminster Fuller, the American systems theorist and architect. 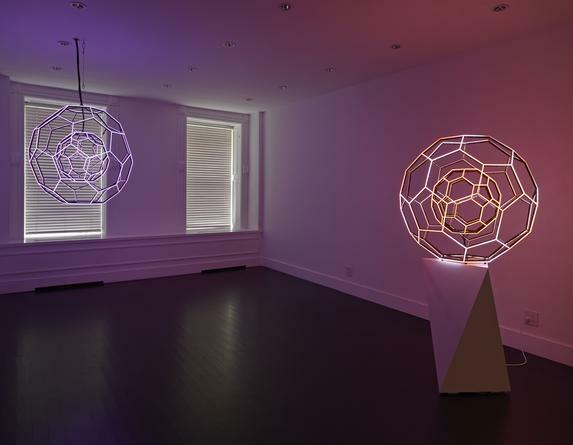 Domestic in size and housed indoors, Villareal’s newest Buckyball is similar in design to the monumental light sculpture the artist presented in Madison Square Park in 2012-13, and shares elements familiar to the artist's work: software programs that sequence light patterns in an infinite combination and with the possibility of realizing 16 million distinct colors, evolving randomly and changing constantly. 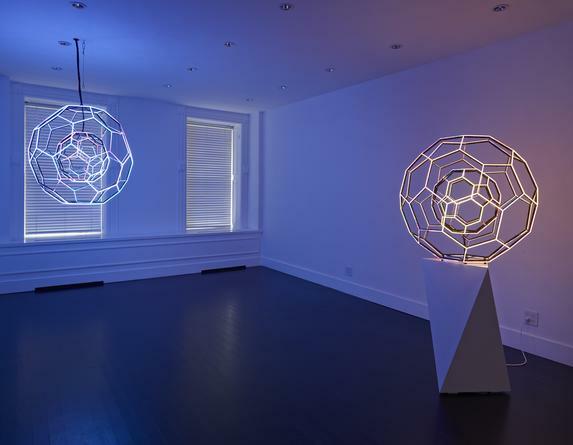 Through basic elements such as pixels and binary codes, Villareal allows for a better understanding of the underlying structures and systems that govern everyday function. 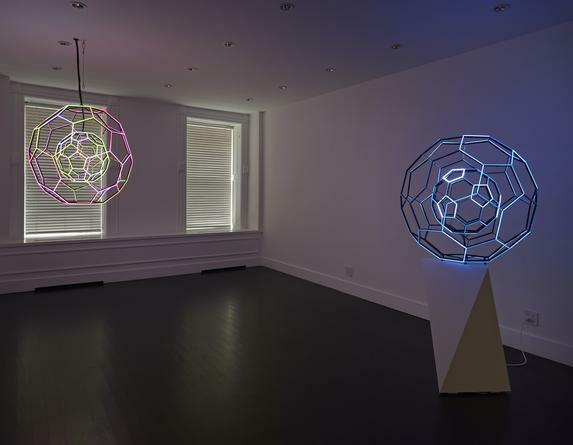 As the artist builds these simple elements into a full-scale sculptural installation that moves, changes and interacts, this work ultimately grows into a complex, dynamic form that questions common notions of space, time, and sensorial pleasure. 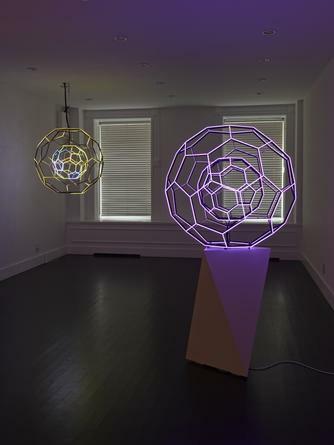 Villareal received his BA from Yale University and his MPS from the Interactive Telecommunications Program (ITP) at New York University’s Tisch School of the Arts. 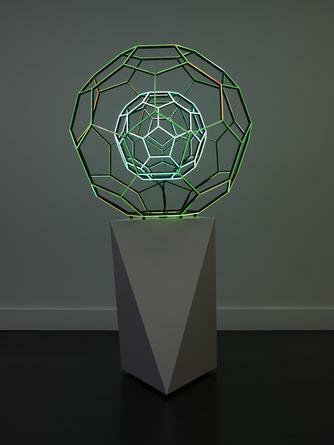 Throughout his career, Villareal has sought to work with the newest developments in technology. 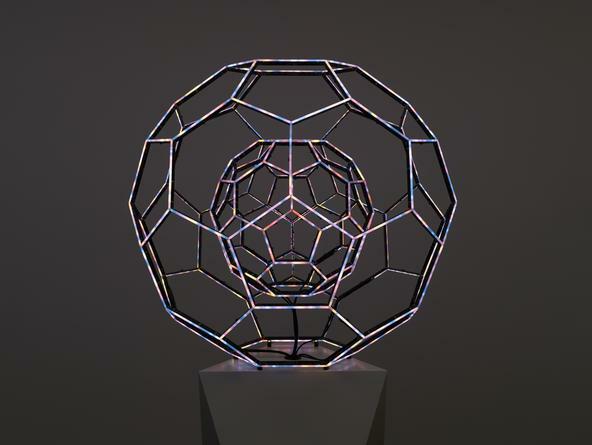 His work can be seen in numerous permanent public collections and locations, most recently including the Museum of Modern Art, NY, The Bay Lights installation currently spanning San Francisco’s Bay Bridge, CA, the Johnson Museum of Art’s building-wide Cosmos at Cornell University, Ithaca, NY, Hive, New York City/MTA’s Bleecker Street subway station, and the Hayward Gallery’s traveling exhibition Light Show, originating in London and now at the Auckland Art Gallery in Auckland, New Zealand. 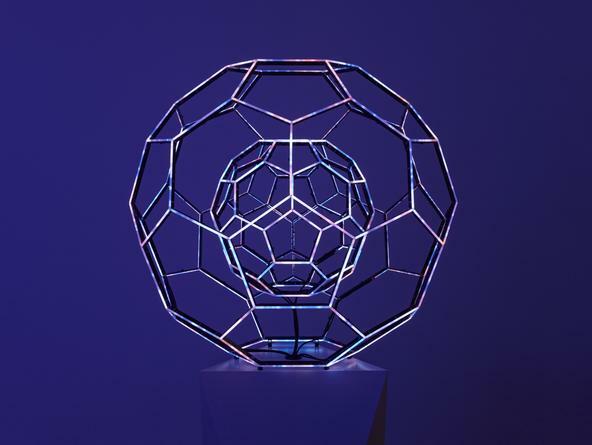 Villareal’s original 30’ Buckyball is viewable as part of the permanent collection of Crystal Bridges Museum of American Art in Bentonville, AR.